Ticket cost is a donation to CFCArts general operating support. Every gift given above that amount goes toward our Annual Scholarship Drive. This year, to kick off our Annual Summer Scholarship Drive, the CFCArts Team wants to entertain you with a cabaret! 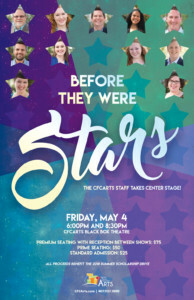 Join us at Before They Were Stars to hear the stories and songs that shaped the CFCArts team you know and love into the *stars* they are today! Make sure to pay the cost of your ticket at time of purchase to secure your seat! Once you hit continue at the bottom of the Donate page you will be promoted to enter your payment information. If you have any questions, please call Russell at 407-937-1800 ext 706. $50 Prime Seating – Guaranteed seating in the center.